My family and I live a very active life. We are always getting into something from walking, hiking, yard games and more. All of these activities do make the same thing happen sweat. So, a good working deodorant is a must have at all times. When I was sent the Dry Idea Pulse Activated Wetness Protection I was surprised at how it works, I mean the fact that the deodorant is basically smart is pretty cool. 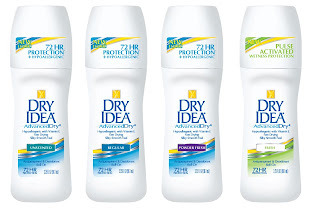 The Dry Idea Advanced Dry Pulse Activated Wetness Protection Deodorant offers odor protection that lasts for 72 hours. It offers a formula with vitamin E for a silky smooth application. I was really excited to see if the Dry Idea Advanced Dry Pulse Activated Wetness Protection Deodorant really offered what it says that it would. I know that it says that if offers 72 hours of odor and wetness protection, but I honestly can't say if it lasts that long. With me taking a shower/bath every night I am not able to tell if this part actually works. But, if it does last for 72 hours this would be great for anyone that works a job where they are on duty for more then 24 hours straight. The scent is very pleasant somewhat fresh. I love that the clean scent stays with you all day which I think is a good indicator that the deodorant is working. You don't have to worry about the scent clashing with you favorite perfume, lotion, or body spray it isn't that much of an elevated scent. I personally love that the Dry Idea Advanced Dry Pulse Activated Wetness Protection Deodorant has vitamin E and is also hypoallergenic. My skin has been on the more sensitive side the last few months since I got pregnant so it is nice to use something that is not interacting with my body in a negative way. The Dry Idea Advanced Dry Pulse Activated Wetness Protection Deodorant comes in roll, on, clear gel and aerosol. So, no matter what kind of deodorant you like you are able to purchase it. I can say that since using this deodorant the last few weeks I have had no issues with sweating or icky smells. The deodorant is working just as it has promised and I couldn't be more impressed with the quality of the Dry Idea Advanced Dry Pulse Activated Wetness Protection Deodorant. You can show some love by liking Dry Idea on Facebook. Antiperspirants are considered over the counter drugs and are regulated by the FDA. Who knew?!! I learned you can become immune to your deodorant. I learned that it contains no water and is time released to keep working. I was shocked to learn that you can become immune to your deo. but if you think about it, a female's body has so many changes as we get older, it does make sense. I do like to try different deos often.